Diamond chips are great accents in small rings. Diamond chip engagement rings are a cheap alternative to larger stones and more elaborate designs, and the versatility of diamond chips also helps keep even heavily accented pieces more affordable for couples on a tight budget. What Is a Diamond Chip? Simply put, a diamond chip is a less than fully faceted stone that does not have a complete diamond shape. The chip may be a remnant from when a larger stone was cut and set into jewelry, or it could be just a small diamond that cannot be crafted into a completely finished shape. Some chips are also the result of cutting accidents when a larger stone is shattered but some of the pieces can be reused as accents. Diamond chips are real diamonds, but because of their incomplete shapes they are far less expensive than larger stones. While some diamond chips are useful and can be fashioned into beautiful pieces of jewelry, a chip taken out of a larger stone has a drastic impact on that stone's value. Losing a chip will disrupt a diamond's symmetry and facets, causing it to reflect and refract light in irregular patterns. This can be particularly devastating for cuts that rely on a specialized light and shadow pattern for their beauty, such as Asscher cuts with their hall-of-mirrors effect or princess cuts with their characteristic interior X pattern. Diamonds with very high clarity, however, can withstand small chips more easily because the stones are so clear that small imperfections are more difficult to notice. 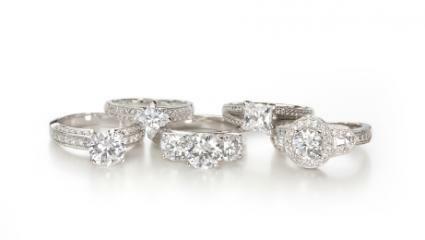 Diamonds can be chipped by sharp blows, improper cutting, and rough wear; to prevent accidental chips, a diamond ring should always be removed when performing cleaning, sports, or other potentially hazardous tasks, and repairs should only be attempted by qualified jewelers. Diamond chips make fabulous accents. Center stones for small carat weight designs. Accent stones for bridal set engagement rings or other multi-stone designs. Small accents for elaborate rings such as Celtic engagement rings or filigree engagement rings when the metal is the focal point. Accents in pave settings when small stones are more desirable than larger gems. Combined chips for illusion and cluster settings to simulate larger gemstones. 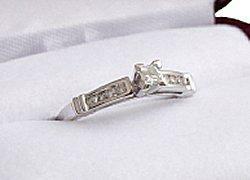 Replacing lost gems in heirloom engagement rings or antique engagement rings for lower cost. Creating replicas of vintage engagement ring designs when frugality was valued and chips were frequently used. Accents for inset designs where the full body of the gem is not visible, such as scatter settings. Accents for figural rings, such as a sparkling eye on a dolphin engagement ring or the center of a flower engagement ring. Because diamond chip engagement rings use only pieces of gems rather than full stones, they are generally less expensive than their more meticulous counterparts, bringing elaborate designs into the price range of many couples. Because a diamond chip already has an incomplete shape, it is important to carefully set the gemstone to maximize its beauty in other ways. Setting chips in platinum, white gold, or silver will accentuate their color, for example. The size of chips can also be enhanced by choosing cluster settings or other multi-stone arrangements that bring several stones in close proximity to one another so their edges can blend together. If a chip is to be used as a focal point of a ring, the setting should be as open as possible so more light can enter and visually enhance the stone, giving it the illusion of a larger size. Chips may be used in bands. Because diamonds are rare and valuable, many jewelers find uses for diamond chips other than attempting to set them into engagement rings. Chips are a superb accent to other types of diamond jewelry, including necklaces and earrings, where they are often used as both focal points and accents. Chips may also be set into cuff links or other jewelry for men as well as smaller pieces for women. Diamond chip engagement rings are affordable, economical choices for many couples, whether they are on a tight budget or are interested in a more elaborate design that would be too expensive with full stones. Regardless of how a chip is used, its sparkle will be just as brilliant as any other gem, and it is still a luxurious and elegant way to symbolize a couple's relationship.